A new paper published Jan. 13 in Science reveals that the relationship between soil fungi and tree seedlings is more complicated than previously known. The paper was co-written by Ylva Lekberg, an assistant professor of soil community ecology at the University of Montana. 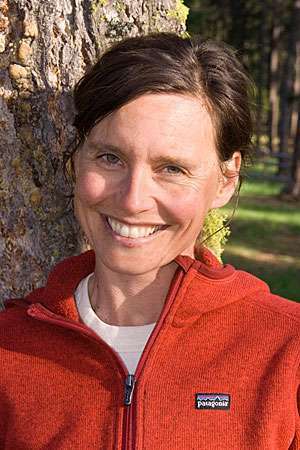 Lekberg and her collaborators studied 55 species and 550 populations of North American trees. Scientists have long known that plants and soil biota can regulate one another, but the new findings highlight the complexity of the feedback loop. "Fungi differ in their ability to protect tree seedlings from pathogens, and this has implications for seedling recruitment and therefore forest community patterns," Lekberg said. Most plant roots are colonized by mycorrhizal fungi, but tree species associate with different fungal groups. The researchers showed that ectomycorrhizal fungi that form a thick sheet around root tips are better able to protect trees from pathogens than arbuscular mycorrhizal fungi. Thus, while ectomycorrhizal tree seedlings actually prefer growing next to parent trees, arbuscular mycorrhizal tree seedlings can only establish outside the control of parents' enemies. This can have consequences for how temperate forests are structured and their overall diversity. "Our findings show that to appreciate the complexity in nature, we need to better understand and consider interactions between plants and soil biota," said Lekberg, who works in UM's Department of Ecosystem and Conservation Sciences in the W.A. Franke College of Forestry & Conservation. She also works with the MPG Ranch, a research and conservation organization in Montana's Bitterroot Valley.